You don't need to force-fit your gravers into handles any more. 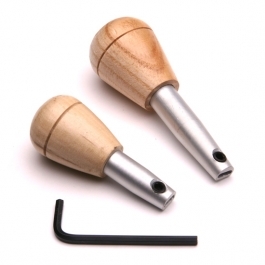 This new Adjustable Graver Handles accept standard or relieved graver tangs. And, you can install your graver as far into the handle as you like. Gravers are held in place by tightening the set screw with the 1/8" hex key (included). Shaped to provide maximum control and comfort. Short style is 2-7/8" long overall and the Long style is 3-1/2" long overall.